While it might take a while to see all that Destiny 2 has to offer, people are already unearthing plenty of Easter eggs and secrets. Be warned, there's going to be some spoilers here if you've not finished the main campaign so if you haven't done that, do so, and come back. So, now you've been warned, let's take a look. We've all jumped to our doom in the tower at least once. You know, just to check. In Destiny 2 there's now a handy tracker to see just how many people are doing it. Head down to the hanger where Cayde lives and you'll find a site safety sign that updates each time someone hurls themselves into the void. During the very first Homecoming mission in Destiny 2 you'll be sent to find the Speaker in the Tower. As you pass through the corridor from the Plaza you'll see this little guy brushing away the rubble. It's a nod to the dutiful little robot that swept the corridor to the Hanger for three years. And in the room immediately after that there's Eris Morn's old cracked glowing urn in the rubble under the partially collapsed stairs. This is an easy one. 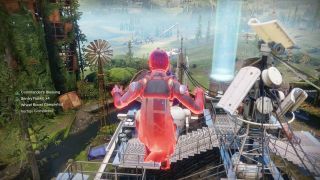 We've a full guide on how to unlock the secret speed boost on Destiny 2's Farm here. But short version: there's some hidden checkpoints that you can race through to unlock a Farm-specific speed and jump boost you can use to explore further. It even has an area of effect so you can share with your friends. Keep an eye on that Methane ocean covering Titan. It's easy to miss because of all the flapping debris and rolling waves but, look between all that and you'll see some classic 'here be dragons' style coils sliding through the waters. At one point during the story you meet Cayde-6 who says "I don't have time to explain what I don't have time to understand." It was a bit of dialogue that really divided fans. Some loved it, some hated it, but it generated so much controversy that it's become a bit of running joke. Destiny 2 director Luke Smith allegedly works it into interview answers for that very reason. Among the different shaders you can collect in Destiny 2 there's this fruity little number, called Watermelon. It's almost certainly a little call out to the long running online fan comic of the same name. Ghost saying "I have a bad feeling about this"
You can't do sci-fi without a Star Wars reference. You just can't. Ghost said in Destiny 1, and he says it again in Destiny 2 because thems the rules. There's a full explanation of how to get the giant Traveller ball in the Tower here. Short version: take the default ball that appears in the main area to a series of different locations and it'll disappear and reappear in a different colour. Take all the balls to their respective locations and a huge floaty traveller ball will drop from the sky as fireworks go off. Just try not to kick it over the nearest railing straight away. Head down into the hanger and to the side of the area where you can play football are some nets that look out towards a big open door. Find the console and you be able to call your ship in to have a look at it, or just show it off. Check out the gantry behind the main area where you spawn in the Tower and you'll find a small pile of equipment that triggers the prompt 'Don't pick me up'. With the Quickness boost enabled from The Floor is Lava challenge you can now jump up to this balcony you find on the way to the bazar to see Ikora. It seems to be where the Warlock Vangaurd lives, as the table is covered in work you can investigate. When you do, Ghost says she's trying to make it easier for people to access the tower. Head down to the hanger in the Tower and get onto the uppermost gantries. Follow them around until you can see this balcony tucked away. Jump onto a shelf below to the left where you'll see a man welding and, as long as you have the Quickness buff from The Floor Is Lava challenge then you can reach the new area. Once there follow the path around, through some air vents and you'll eventually reach a room where you can investigate the table to find a mention of Ana Bray. She's a Hunter briefly mentioned in Destiny 1 who was an old Hunter Gunslinger who fought in the Battle of Twilight Gap. References to her are related to time travel so either this is a throwback to some old lore, or maybe setting up her arrival in this time period. Let us know if you see anything in the comments below and I'll add them in. There are mentions in the official strategy guide for two treasure chest keys called the Dance Party Key and Loot-a-Palooza Key, but no one seems to have found them yet. Either they were pulled before the game launched or are reference to something that isn't accessible yet.